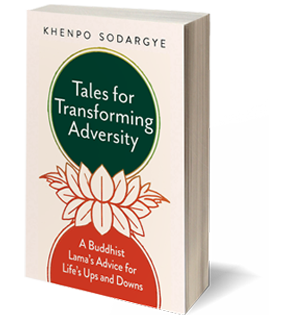 Khenpo Sodargye, one of the world’s most popular Tibetan lamas, shares accessible advice for working with adversity and living a spiritual life. Personal and heartfelt teachings on the Buddhist path by H.H. Jigme Phuntsok Rinpoche, one of the most influential Tibetan lamas of the twentieth century, compiled and edited by Khenpo Sodargye Rinpoche, an acclaimed Tibetan scholar and leader of a key center of Buddhist learning. What is true happiness? What is the cause of our suffering and dissatisfaction? And how can we live with the kindness and clarity of the Buddha in our own lives? 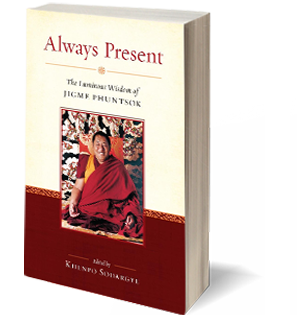 This compact collection of teachings from Jigme Phuntsok Rinpoche, collected carefully and elaborately by Khenpo Sodargye Rinpoche, illuminates these most fundamental questions about the Buddhist path and provides essential guidance to help you along the way. Oriented to both beginners to Buddhism and longtime practitioners alike, these teachings offer precious insights on the Buddhadharma to return to again and again for inspiration, encouragement, and practical advice. One of the world’s most popular Tibetan lamas shares accessible advice for working with adversity and living a spiritual life. Enjoy a variety of meditations on topics from flattery and jealousy to karma and compassion. Enjoy a variety of meditations on topics from flattery and jealousy to karma and compassion. In each brief chapter Khenpo Sodargye weaves in stories from ancient classics and modern headlines. Drawing on adages from the Buddha, Confucius, and even Mark Twain, he delivers simple and timeless insights about facing adversity and developing a good heart. With this English-language edition, you can now join the tens of millions who have already benefitted from this ageless advice on money, relationships, mortality, and more. A prescription given by Khenpo Sodargye Rinpoche to modern people as a practical instruction to deal with all kinds of changes and uncertainties in modern life. Many people complain that life is too difficult, and they seek solutions in the Buddha‘s teachings. In reality, even if you receive the best instructions, they are ineffective unless you apply them. It is like a doctor treating your disease. If you receive the medicine but do not take it as prescribed, you will not be cured, even if the medicine is powerful enough to raise the dead. Only through hands-on application will its usefulness (or the lack of it) become clear to you. 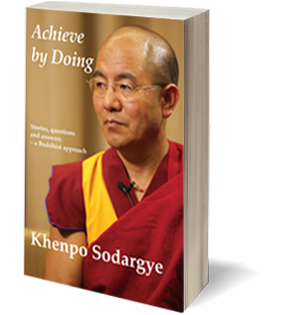 Therefore, Khenpo Sodargye Rinpoche wrote this book that contains many practical instructions, and have titled it Achieve by Doing. Try to work on these methods authentically; test them out yourself. Do it! Only then, through the subtle blessing of the Dharma, will you experience some benefit, physically as well as mentally. Khenchen Jigme Phuntsok shares the essence of his teachings with his students. 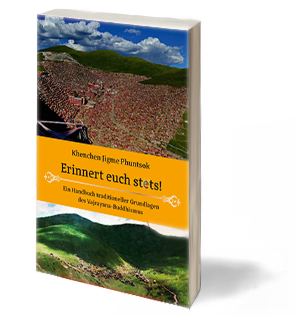 This book is based on the transcripts of previous audio recordings of Khenchen Jigme Phuntsok’s teachings and advice. They are written in a simple, uncomplicated and very personal style of teaching. Khenchen Jigme Phuntsok teilt hier die Essenz seiner Lehren mit seinen Schülern. Dieses Buch basiert auf den Niederschriften früherer Audioaufnahmen von Khenchen Jigme Phuntsoks Unterweisungen und Ratschlägen. Sie sind in einem einfachen, unkomplizierten und sehr persönlichen Lehrstil verfasst. Seine Schüler haben es aus dem Tibetischen ins Englische übertragen und unterteilten die Texte zu Ehren des 13. Jahrestages von Kyabje Rinpoches Parinirvana in 13 Kapitel und in Würdigung der Lebensspanne dieses großen Meisters in 71 Abschnitte. Das Buch erscheint fast zeitgleich auch im Englischen unter dem Titel: “Always Remember” und ist bereits früher von Khenpo Sodargye ins Chinesische übersetzt worden. Basierend auf der chinesischen Version wird es weitere Übersetzungen geben, so u.a. ins Italienische, Spanische, Polnische, Niederländische, Koreanische, Japanische und Vietnamesische. Wir laden unsere deutschen Leser ein, dies historische Dokument als einen Ausdruck tiefer Hingabe an die Tradition zu sehen, deren Vergänglichkeit auch in diesem Text immer wieder durchscheint und sich in der erst kurzen, aber dennoch höchst wechselhaften Geschichte des Ortes Larung Gar widerspiegelt. The poems and teachings of a beloved Buddhist master, vividly presented so that readers feel they are listening to the precious and renowned teachings of His Holiness directly—and learning how to live with more joy and ease. His Holiness Jigme Phuntsok was a prominent teacher in the Nyingma tradition of Tibetan Buddhism. He was recognized as a tertön and renowned for his mastery of Dzogchen and his visionary activities, including the establishment of the nonsectarian Buddhist community of Larung Gar, one of the largest monastic settlements in the world and a vibrant Buddhist teaching center that has contributed enormously to the resurgence of Buddhism in China. 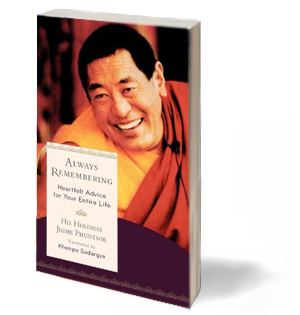 In memory of the thirteenth anniversary of Rinpoche’s passing, this book was compiled of his precious and renowned teachings. It includes stories of the lives of great masters, as well as teachings on the principle of cause and effect, keeping an open mind toward all religious traditions, spreading the Dharma and benefiting sentient beings, and mastering what to adopt and what to abandon. Readers will also learn about Tibetan culture, customs, and the many kinds of Tibetan tulkus. His Holiness Jigme Phuntsok’s heartfelt advice on how to improve interpersonal relationships enables us to live with more ease and joy. Five poems by Jigme Phuntsok in both Tibetan and English translation enrich the teachings with His Holiness’s poetic voice.